Back in this post I mentioned I was giving up on submitting tutorials to magazines for a while in favor of helping some new blood find their way onto the pages. Now, that's not to denigrate or put down any of the familiar names in magazines -- far from it. I have a lot of friends who I love to see. I'm just sad when I get an email from someone asking what the "trick" is to get "on the in" with a magazine, or telling me they've given up before they've even started. Well, I had one more tutorial spread that had been in the works for a while (and if you're new to the magazine biz, once you submit a tutorial, it can take from six months to a year for it to be published). 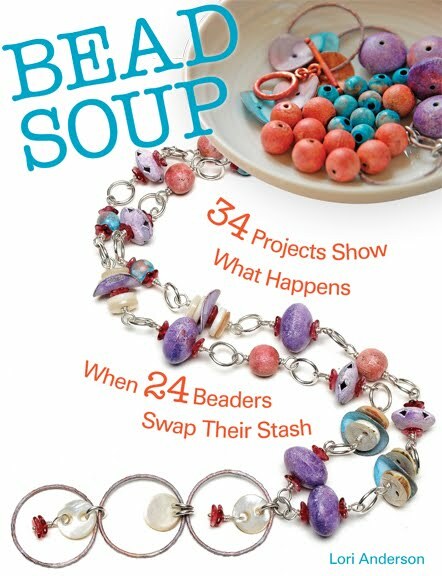 I think this was a cool way to sort of step away from the tutorials for a while and go out with a bang -- I am the Featured Designer for this month's BeadTrends magazine. I'm going to show you what I made, and how you can do this, too -- how there's no trick, really, to getting published, other than keep sending photos in to the magazines, making jewelry that is pretty/interesting/unusual, and following a few rules. OK -- simple, simple, simple. Anyone, and I mean anyone, can do this. This is about color and texture. If you're stumped on mixing colors, grab a graphic designer's color book (this new one from Colourlovers is amazing) or take a visit to fabric shops with a notepad and write down things you see. Texture -- throw in the unexpected. I added wood, a textured metal bead, and one of Nan Emmett's ceramic beads and knocked away the "smooth and even" look. Charms on the toggle is always a fun touch, AND a great counter-balance for your bracelet so it's not constantly sliding toggle-side up. See? You can do that. Now make it, take a great photo with the macro setting of your camera, and submit it. This one is called "Heart of Whimsy", and shows what you can do with one really, really cool pendant (this one by MistyMade). Sometimes you buy a pendant that's so awesome the necklace sort of works its way around it. If you don't have the beads for a particular piece, take it with you to a bead show. In this instance, I found carved dyed chalcedony beads in that yummy orange-slice/coral color that went just right with the pendant. However, too much of a good thing can be bad. Stringing both sides in the same way, even if I'd asymmetrically strung the kyanite and the chalcedony, would have weighed down the pendant. To keep it light, I went to chain. But if your chain is too thin, your piece will look lopsided. When choosing chain, (and clasps!!!) make sure you're choosing the absolutely best solution for the size of your beads and pendant. See? Now pull out that pendant I know you're hoarding because it cost more than you meant to spend and make something stellar. 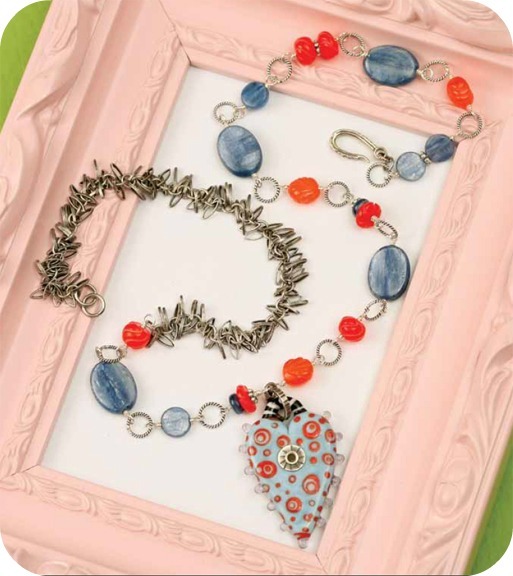 I love this piece (in part because that coral rose came from beading friend Cindy Wimmer) but also because it shows you can use any manner of materials to make something interesting. The toggle on this bracelet is pewter, and therefore less expensive than sterling. 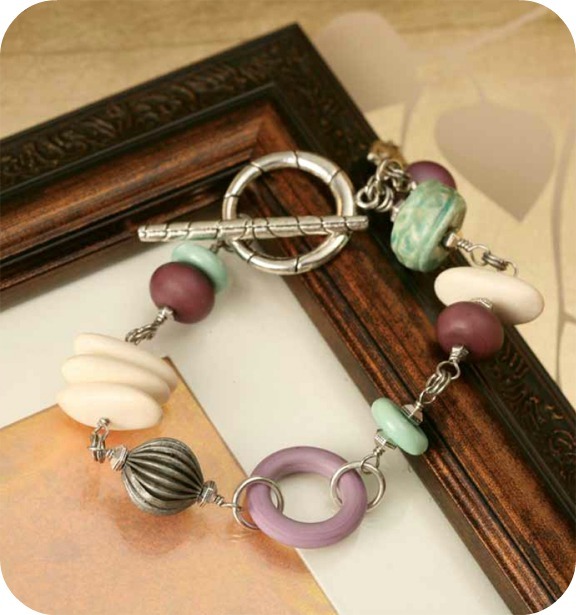 The beads are a mix of gemstone, seed, handmade lampwork glass, and shell. They all play well together if you take some time to fiddle with them. The lesson here -- don't get bogged down with "oh, I only use crystal with my lampwork" or "I could never mix gemstones with seeds". Um, yes you can. Now go try it out. ... and it was flatly rejected. Thanks, very pretty, but not what we're looking for. OH but was I dejected by that rejection. I SO loved this piece, I couldn't stand it. But I kept it, and later, added a gorgeous focal from Badger Beads and turned it into a necklace, and tried again with a different magazine -- and they liked it and published it. Lesson here -- you never know what a publisher is looking for. And sometimes, neither do they. Some publishers will put out a list of themes or styles for that month. Some just know it when they see it. You can't take rejection personally (ok, well, maybe for a minute, but that's ALL!) -- you just keep trying. I've had FAR more rejections than I've had acceptances. * You can get artsy with your photography, but don't get SO artsy the publisher can't tell what they're looking at. * Know the magazine you're sending to. Don't send to a seed bead magazine if you don't seed bead. * It's fine to be inspired by someone, but don't copy them -- you'll never get published that way. I'm by no means an expert, but I've been published (and rejected) enough times to have a feel for things, and I want to help you in any way I can. If you want me to take a look at your designs or photos, feel free to email me or send me a message on Facebook. Let's see your fresh new face in a magazine!!!! (All photos except last one by BeadTrends photographers). Thanks so much for the encouragement and advice. Getting published is one of my definite goals (at some point.) I just can's seem to organize my thoughts. There's so many different criteria for each of the magazines. I'll get it straight one day! In any case, thank you!! As well, I picked up my very first copy of Bead Trends yesterday and was thrilled to see you as the featured artist. It was one of the highlights to my day!! Congratulations on your Bead Trends Feature! Beautiful pieces! I subscribed to Bead Trends just recently, but I don't think it will start until next month. I'll have to pick this issue up at Hobby Lobby. Thanks so much for the helpful tips. My issue is mostly a 'I'm not good enough' issue, which I'm definately working on. Also, thanks for the links to the bead artists! Thanks for the great article, Lori and for generously sharing your knowledge. Although I"m not quite ready for publication, hopefully I will be able to use these tips one day! 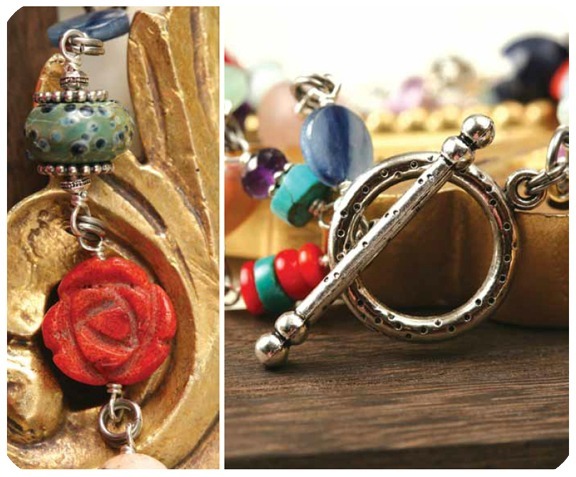 Congratulations on being featured in Bead Trends! i loved that last bracelet with all the buttons..you're right don't get down if something isn't accepted at first..
thanks for sharing info about getting published. Congrats on being the feature artist in Bead Trends-very exciting! I am still waiting to receive my copies. I have a necklace in the magazine (I think). Thanks for all of the advice you offered. I dreamed of being published for a few years and then finally told myself to stop dreaming and start submitting! I love that last necklace that used to be a bracelet! There's just something about that piece as a necklace. 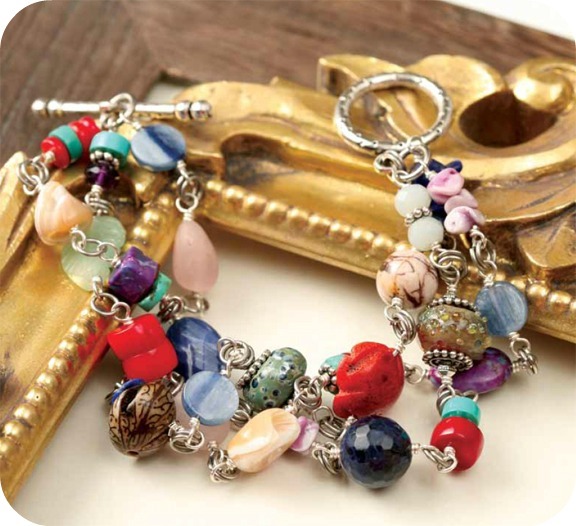 Lori - Congrats on getting the Bead Trends feature! Also, beautiful pieces and excellent advice. I am proud to say that I will have my first published set (bracelet and earrings) this December in Bead Trends! I have a lot to learn, and will keep on submitting using your great guidelines. You are such a generous person, Lori. I thank you for offering to help me (and others like me). I took that offer personally and may just take you up on it someday! Thanks. Thanks...I'm going to print this out, and while magazines is definitely on my list of "stepping stones" I don't think my work is refined enough at the moment to submit...I'll get there though! Thanks again for being so helpful!! Thank you Lori. I love your tips. Congratulations on the Bead Trends feature. And a really big thank you for taking the time to do a beautiful job of putting together such good advice. It's very generous of you. Thanks for this wonderful post. Lori, you gave us hope and inspiration. Now I am going to try. I'll check out your page in Bead Trends next time I go to Jo Ann.Congratulations! Hi Lori, thanks for sharing all your wonderful tips, you are a very kind and generous person...this is one magazine i have never seen in Canada..i wish we had it..i don't really like to get the scrips i would have way too many and i sort of like to have a little peek before i purchase it...if any of my fellow Canadians know where to get it please..do tell. Bead Trends! Awesome, Lori! I have an online subscription. I'll have to check it out! I agree, it would be fantastic to see some new faces in the beading magazines. I'm starting to see so much of the same old-same old that it's not inspiring to me anymore. I want to see avant garde. I've never submitted work because I don't think my style fits the mold. Or do you know of a magazine I should try out? I'd love to be published other than on my blog! BTW, Jayne of Badger Beads is one of my favorite lampwork artists. I love her beads! Lori, congrats for being selected, and thank you for being so supportive of those of us just getting a start. I've just been mulling over some of the issues you discuss here and in one of the previous posts you linked to, so I felt you were speaking to me! I imagine others felt the same! You are a generous mentor! Congratulations on your feature, Lori! And thank you for being you and being real, boiling it down to the basics. One thing you haven't mentioned in this post is: what happens next. The whole theme of this post has been 'take a good picture, and send it off - it's either a yes or a no'. That can't be all that happens! You say there are no tricks, and call this post tips and hints - but it was only really tips and hints about making the jewellery, not how to get into the magazine. GREAT POST MY DEAR FRIEND. Elizabeth -- that all depends upon the magazine. 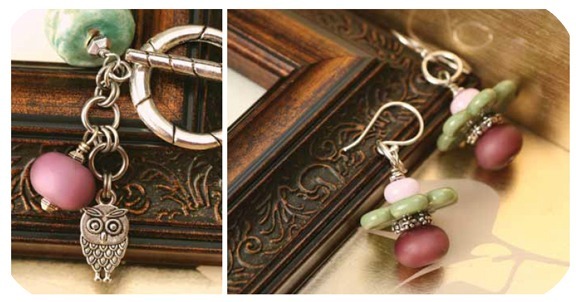 Some, like BeadTrends, write the tutorial for you, as they make an accompanying piece to go along with YOUR piece. Most others require you follow their guidelines for writing a tutorial. Some don't require you photograph the process (such as BeadTrends) but some do (such as WireStyle). Some will ask to see your jewelry first before making a final decision, and then decide that it's better suited for a sister magazine. If you email me, I can go into further detail. Congrats on being the featured designer! Your pieces are lovely. I cannot wait to see this issue. 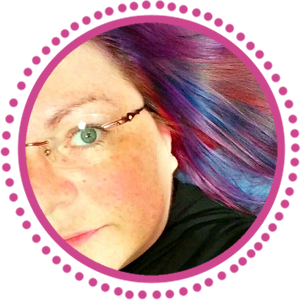 How exciting to be featured- I think your Karma is extremely good and you keep stoking the fire with your kindness and generosity!! I so appreciate all your tips and sharing. Thank you!! Thank you for the advice Lori. I am one of those who use to say "No, I cannot use this with that" and I know I must work on that. 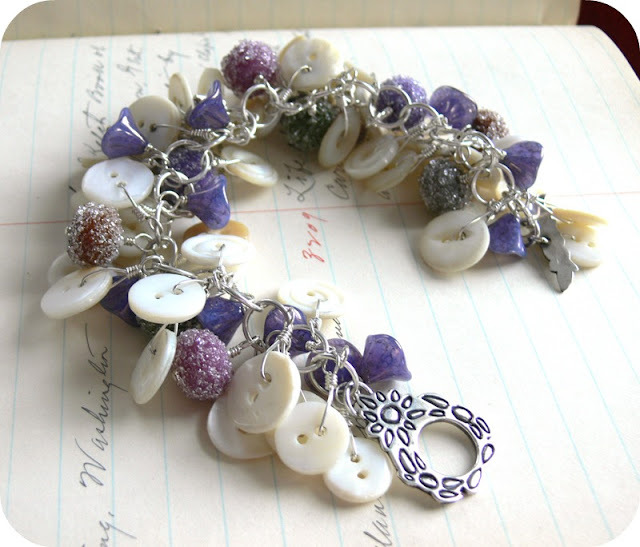 I would have never made a bracelet/necklace with buttons and beads but you did and it's great! I have so much to learn! 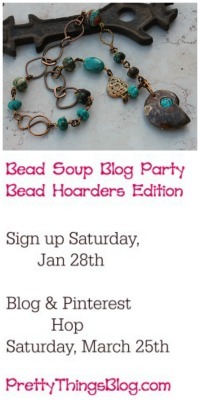 Woops, Elizabeth, edit that -- BeadSTYLE writes the tutorial for you. You have such a great design eye- for color, weight, and balance. Thanks for all the great advice and ideas! Congratulations Lori. I did see your featured Designer spread in Bead Trends. F.A.B.U.L.O.U.S.!!! Your words of wisdom are true and very helpful. Never give up. That's great that you've been published. I really appreciate all the great advice about submitting to magazines! Thanks for all the personal experiences. I know the feeling of not having something accepted, but then when you least expect it, they respond with a YES. Very exciting!! Thanks again Lori- love reading your blog- your son reminds me of my 17 year old son when he was younger. You seem to have a very close relationship much like my son and I still do.Its wonderful isn't it? Congrats Lori! Thank you for your words because last year I listened and on a whim submitted a pair of earrings to be published and Beads Trends pick them up! 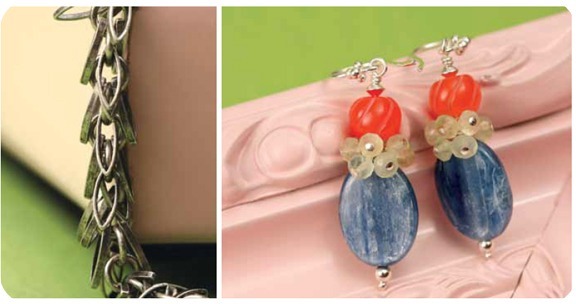 I have had three pair published so far including my Sunset Blooms in Beads Trends this month (pg. 65). It really is trial and error. I now want to have a bracelet published. I too encourage everyone to keep up the submitting and make jewelry that you feel is striaght from you. In doing the BSBP I have seen some awesome pieces very worthy of being published. Hi Rosemarie -- in my experience, all the magazines I've submitted to have sent me an email letting me know I've been rejected. If it's been a long time, you could send another email, just be sure it's not only a few days afterward. Also, be sure to recheck their submission page (if there is one) to see if there's a reply date on it, and of course check your spam folder and make sure their address is on the "white" list. Very nice! The third one is my favorite.. thanks for sharing! I loved it when I opened up my Bead Trends mag and saw you as a featured artist!! Congrats! I love the way you make your juwelry. 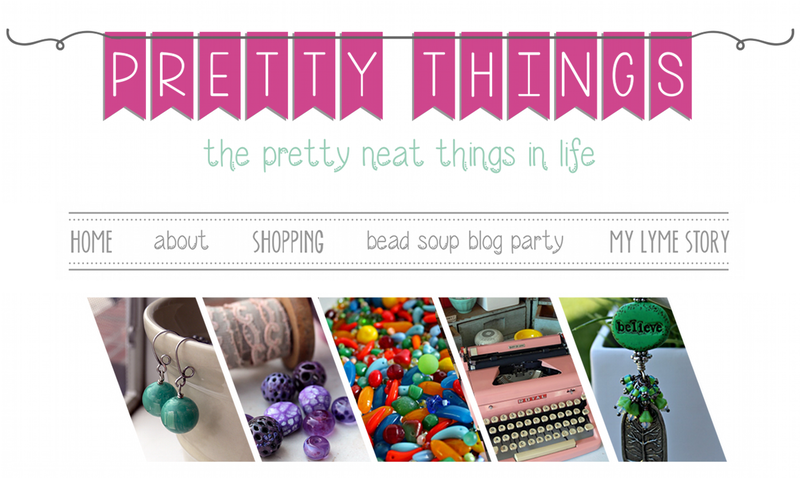 It's always nice to have a look on your blog!